Wall cabinets: High Gloss White Paint. Dan Hoenig loves getting things just right for his clients. The owner of Brookville Cabinet & Design in Cedarhurst, New York (Long Island), has been particularly skillful, with Grabill’s help, at getting the price just right along with the décor and layout. With the various color schemes nowadays, Danny’s creations fit right in. He likes to use a modern-looking door style in a stain or painted finish. 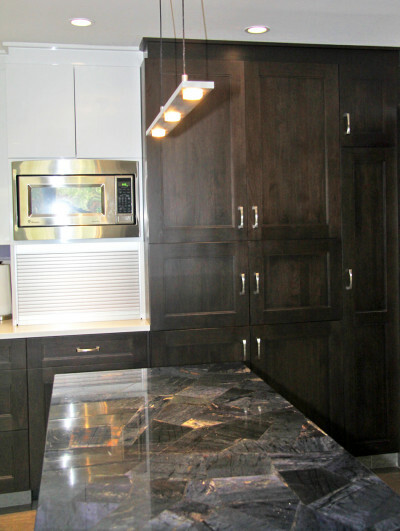 For a more modern look, while keeping the transitional feel, he prefers high-gloss white or beige for upper cabinets, and a dark hickory for lower and tall cabinets. “The construction and the quality of the cabinetry from Grabill are very high end, but using hickory keeps the price down,” he said. 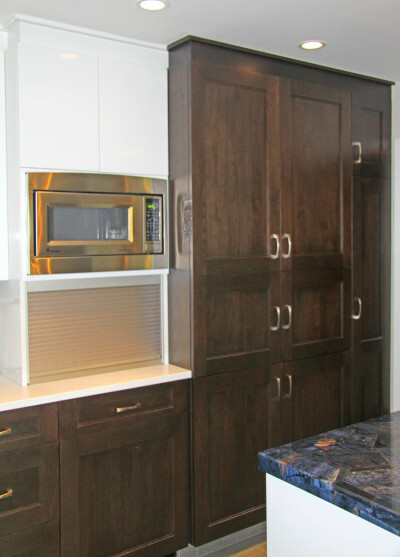 Also, Grabill’s semi-custom capabilities are helpful in delivering a custom look with standard-sized cabinets and a few well-placed custom touches. For example, Danny will use a custom cabinet to finish off a row of standard cabinets to provide a perfect fit for the space, rather than using a piece of filler with another standard cabinet. “It looks good, but there’s only one custom cabinet involved,” he said. “If I’m able to give customers something that gives them the same look, with the same hardwood quality, but at a more affordable price, I’m going to make a sale,” said Danny. And in a competitive environment, Danny has come to rely on Grabill to give him some affordable solutions. Creative building projects like this is what Danny grew up with. “I was always handy. I always used to build things. I always had a shop. My grandfather was a builder,” he said. And now, he’s making his mark in the design business. A year and a half ago Danny expanded his operation to open a 6,000 sq. ft. showroom with another designer in a former Gap store, where they also rent space to a carpet business, custom-closet designer, a landscaping business and an appliance businesses. “It’s a very big store and a great location,” he said.